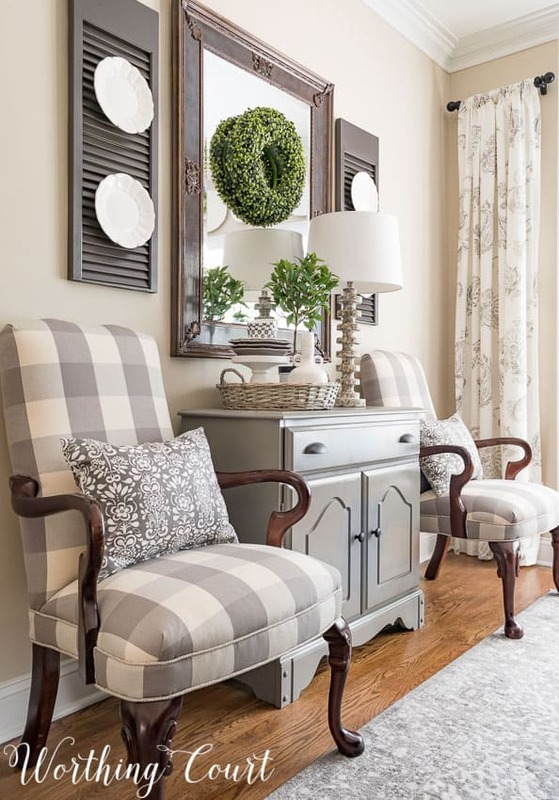 As a home decor blogger, my mission is to use my home to help inspire you to create a home that you and your family will love and be comfortable in. And that my friends, means one thing – constantly changing up my decor! Whether refreshing my home for the change of seasons or decorating for a holiday, things are always changing around here at Worthing Court. There’s no fun or challenge in simply running out and buying something new every time I’m ready for a change. I find it much more satisfying when I work to reuse as many items from my stash as I can. If something doesn’t fit the look that I’m after, then I try to change it in some way so that it will. With that in mind, I’ve learned to keep a variety of decor staples in my arsenal. Here’s my list of six that I can’t “live” without. 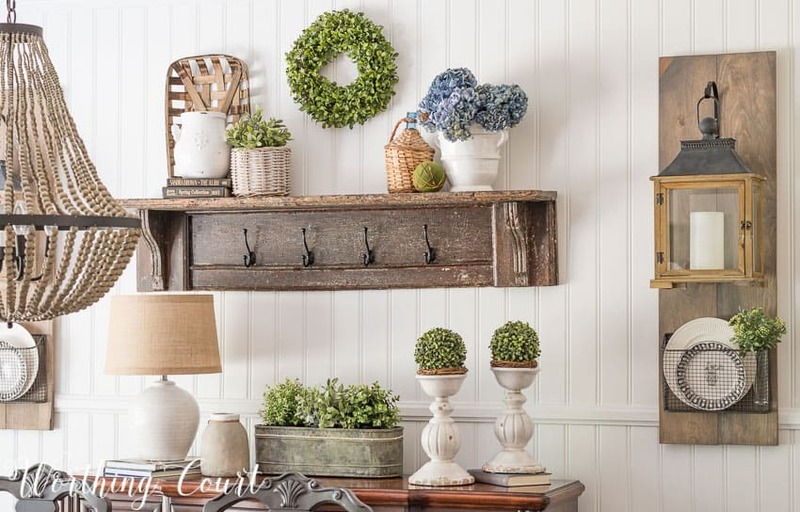 Oh goodness – the possibilities of what can be done with these decorating staples are limitless! You will frequently see me using a basket or tray as a backdrop to a vignette. Sometimes having a solid piece behind your decor will give the area a more finished look. You can see that I used not one, but two trays as a backdrop on the open shelves in my breakfast nook last Christmas. The entire arrangement looks so much better to me than if there was just bare wall showing. Plus, a tray in the back helps your decorations to pop! Trays are awesome for grouping items together and giving them importance. The three plants grouped together on a small tray on this bookcase look so much better than if three pots were just lined up in a row. I hoard old books and use them everywhere! I’m very picky about which old books I hoard though. I typically look for books with black covers and/or black spines. My favorite trick for using books is to add height to lamps, vases, containers – you name it. I rarely pass shutters and bifold doors up if I find them a great price. Talk about something that makes a great backdrop! This area on our back porch wouldn’t look nearly as inviting without the set of bifold doors that I have standing behind the chest. I added hanging plates to the shutters flanking the mirror in my dining room. Sometimes, I even hang tiny wreaths on the front of the plates when doing seasonal decorating. Lanterns are super easy to fit into your decor! I believe there’s a style for every taste and budget out there. I like to use them in unexpected ways, such as when I used lanterns in my fall planters as candle holders. I love, love, love decorating with dishes! I hang them on the wall, I stack them on a pedestal and I fill tool boxes with them on the shelves in my breakfast nook. My everyday dishes are white – Mikasa Italian Countryside, but I love sprinkling in a few seasonal colored ones. My favorite resource for dishes to decorate with is the dollar store. Oh, how I love wreaths! I have them everywhere around my home. It’s really hard for me not to go overboard with them. I keep a supply of wreath forms and grapevine wreaths in my stash so that I don’t have to run out to the store every time I want to make one. When I’m shopping, I’m always on the lookout for a great price on certain items that I’ll be able to use over and over to give the decor in my home a fresh look! 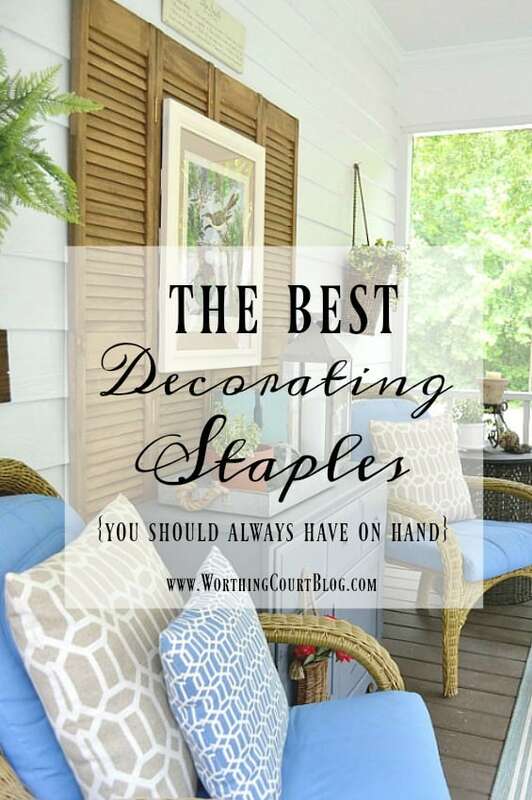 How about you – do you have favorite decorating staples that you like to use? I too have become addicted to wreaths however I am trying to keep it to a minimum. My husband is not happy to store them due to unavailable space. I have chosen to keep it to greenery, magnolia, and grapevine so I can add adorn them to change it up. Suzy, you are correct that baskets or trays are a must! Thanks for sharing. 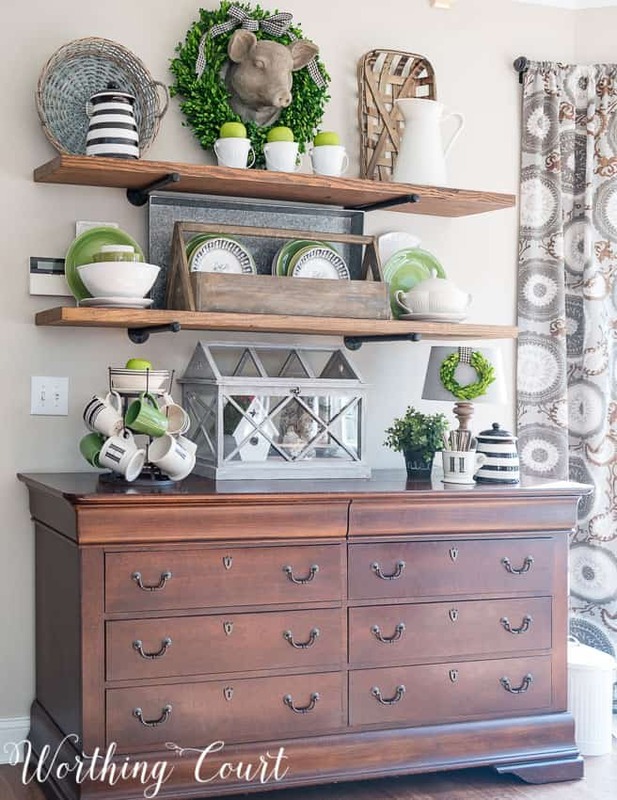 I love how you’ve used baskets and trays to create new looks … they really are a decor staple!! Love your style. You make everything look so easy. Thanks for the inspiration. Happy Monday. 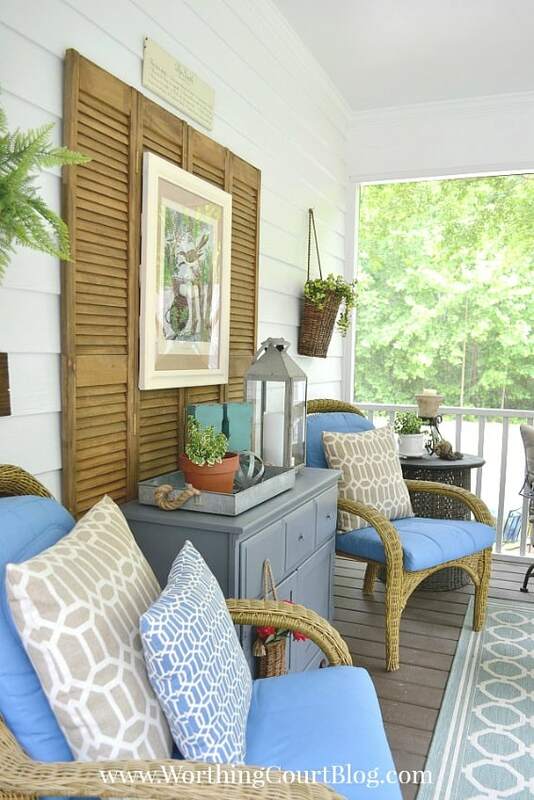 My favorite tip of yours is to decorate with shutters. I just love the texture and dimension they add! 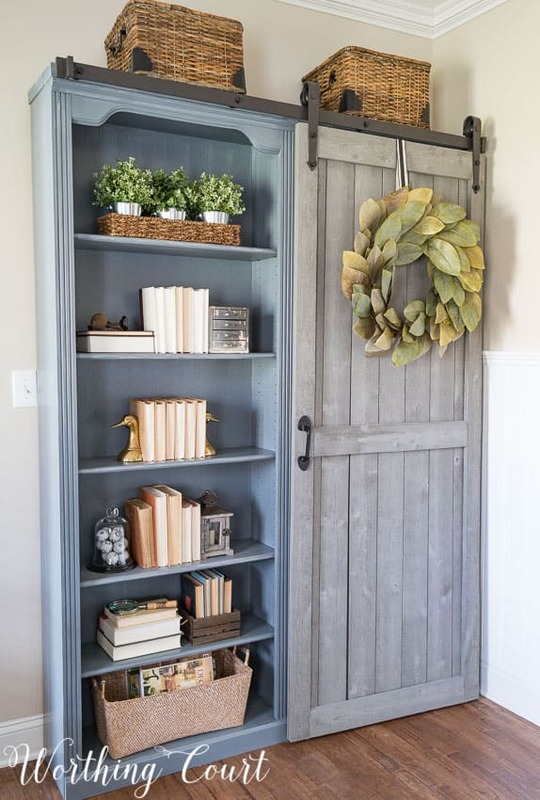 I like what you have done with the shutters and with the books. I’m now watching for shutters when I’m out and about. Great ideas. I love the photos supporting your choices. Thanks! I too love baskets, trays and tool boxes. They are so handy but love the look of them. You have a beautiful home and thanks for the ideas. I love all the big flat trays you use as a bases and backdrops. Great list of staple items! Always nice to be able to save money and be creative with stuff you already have on hand! 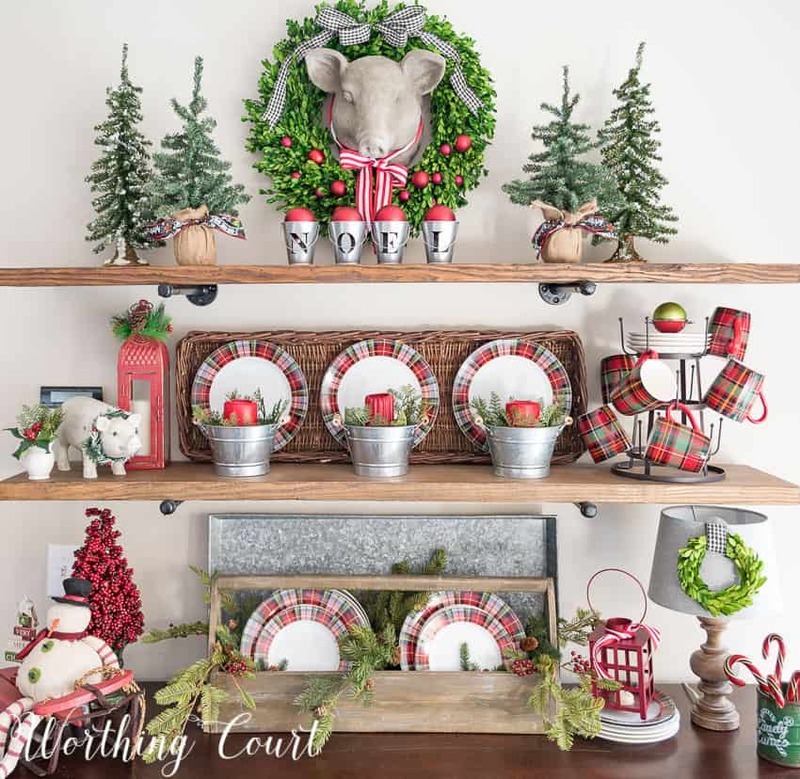 Wonderful ideas of what to keep on hand for decorating! Great ideas. I am all about the wreaths. I just ordered the magnolia wreath and can’t wait to see it. Good idea to keep some in stock to change around. I never tire of seeing your beautiful home Suzy!! Great tips as always. Love your ideas! Thank your for your posts! 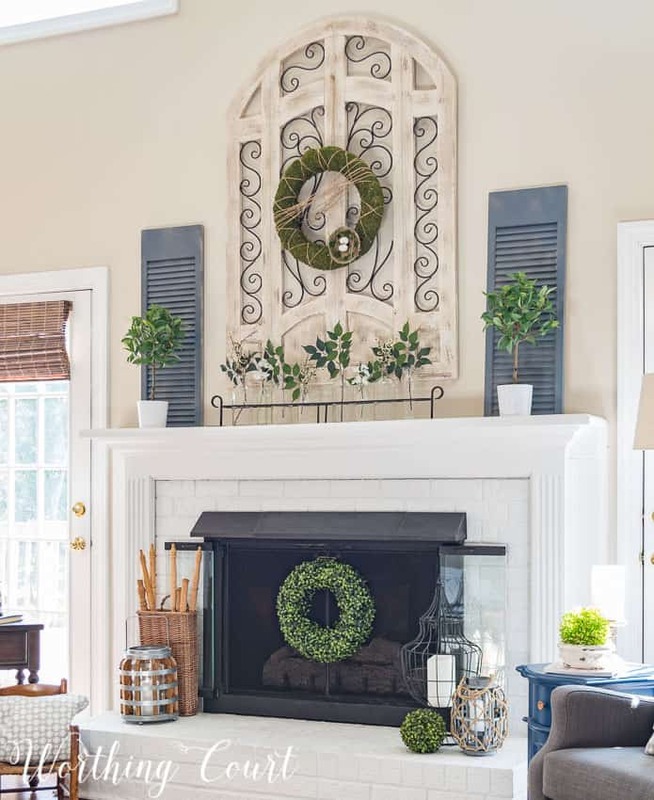 I really love the simplicity of the fireplace with the green wreath. Beautiful. Great ideas, Suzy. Thank you. These are great staples to have. I just need to learn how best to store them, when no using them, in my Wee Abode. I’m sure I’m still not using my place as efficiently as possible. But, you inspire me to work on doing just that, in order to have a lovelier, peaceful home. Thanks, Suzy! Love the pig head how adorable very creative ideas I like the way the shutters are used throughout the deco. I used the spoon carved fronts of an old dresser as you did your shutters to hang on the sides of my picture on the fireplace mantel, they look awsome and I got the idea from you. You have a Beautiful home. Have always loved wreaths and shutters. Enjoyed seeing all of your ideas….. I love all of your ideas. I especially like your shelving in your breakfast room. I would love to have the room to do something like that. It would be great fun decorating it for the seasons of the year. Happy decorating. I also love baskets, but I’m usually just using to control clutter! Love the way you use them in your arrangements! Love how you change out the shelves in the breakfast nook. I’m just wondering if your colored plates are dessert plate size or dinner plate size? Hi Ginny. I usually use a combination of dinner plates and dessert plates so that I can layer them better. If you’re asking specifically about the green plates, those are dinner plates from the dollar store. Another group of great ideas to put in my file notebook for future decor ideas. Very helpful post! I need to add some trays to my decor stash. I love all the greenery you add to spice things up. Just noticed while scrolling through your post, that you put a small wreath on a small lamp. I love seeing something new and different every time I look and who doesn’t like tips on saving $$ by reusing what you have. Thank you for your practical and pretty ideas. 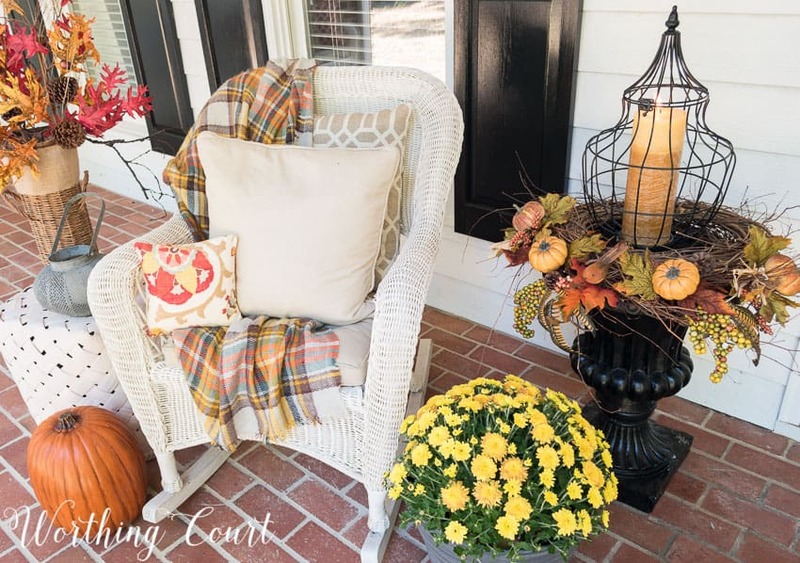 I’d like to invite you to share this at the brand-new Farmhouse Friday Link Party! To celebrate the kick-off of this party, I am giving away a $50 Amazon gift card. I will also share your linkup on DIY Farmhouse Style Facebook group where I admin, which at this writing has over 130k members! Suzy, I just love your style! Great list and you reminded me that there are things I already have that I can use to redo the mantle. Like the old lantern out back. Thanks for sharing with us at the Family Joy Blog Link Party this week. It’s always great to have you there! These are great ideas. My mama always said that you can never have too many baskets! I am pretty well covered in most of these areas, but I need to get some shutters now for sure! Pinned and sharing. Thank you for joining us at Family Joy Blog Link-Up Party. I hope you will join our next party starting Sunday at noon EST. Thanks for these tips! I love your style! Love your website and look forward to reading it each morning with my tea! I get so many ideas. Always enjoy reading your post! Inspiring and helpful. Thank you! A lot of great advice, I love your gray cabinet. 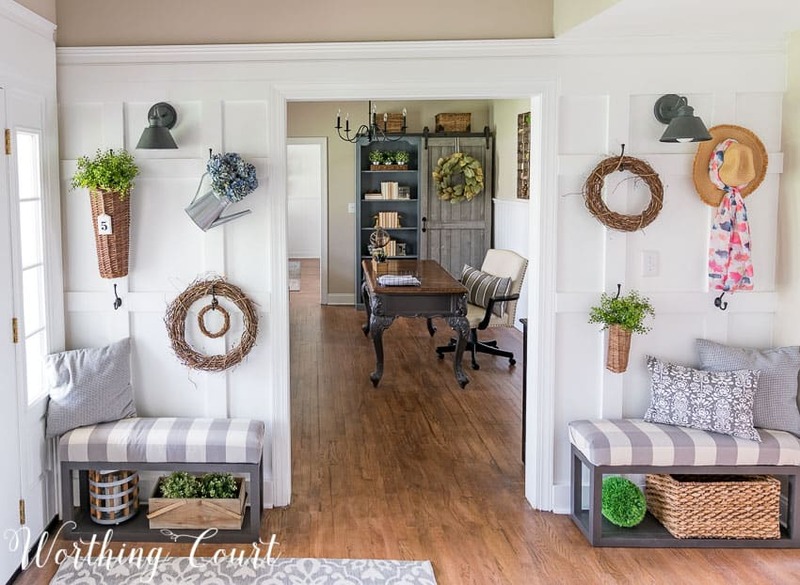 Just stumbled upon your great blog through the Scoop Link Party (via Stone Gable Summer Home Tour, via Shabby Creek Cottage). You have great ideas, tips and tricks. You are now in my list of “go-to” blogs. Thanks for this giveaway!